Lot of 12 Car Auto Flexible Spout Gas Oil Water Fluid Fuel Funnels Truck Extension ! This lot includes 24 separate pieces: 12X funnels and 12X flexible extensions. 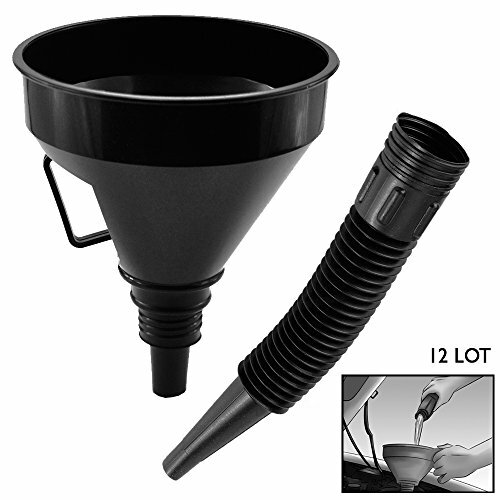 Easily add oil and other fluids to your car with this lot of 12 Black oil funnels featuring durable plastic with separate flexible extension attachment for accuracy and a convenient side handle for a sure grip. If you have any questions about this product by Pride, contact us by completing and submitting the form below. If you are looking for a specif part number, please include it with your message.